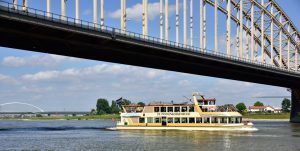 An extra large cruise of 2 hours under the several bridges in Nijmegen, full of variety. We also sail along the beautiful nature reserve ‘the Ooijpolder’. For our younger guests, we have a large playroom filled with balls in the hold of the boat. We have also colouring pictures and colour pencils. This way they won’t get bored! In a relaxed atmosphere you can enjoy the pancake buffet. On the buffet are freshly baked natural, apple and bacon pancakes and all sorts of dishes to garnish your pancakes, like cheese, ham, fruits, jams and eggs. Ideal for a family getaway, anniversary or corporate event!